Yes, yet another BABYMETAL post. Only this time, it’s a bit of fan art to celebrate Fox Day, which is today (April 1). There are larger images in the usual places (but not Enty). 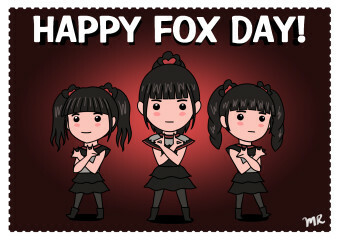 This entry was posted in Fan Art, Japanese Music and tagged BABYMETAL, DeviantArt, Fox Day, pixiv by maruserino. Bookmark the permalink.